A postcard from a K.O.Y.L.I. The unsigned message on the back of this post card says:- In this camp I lived for 5 months Apl. 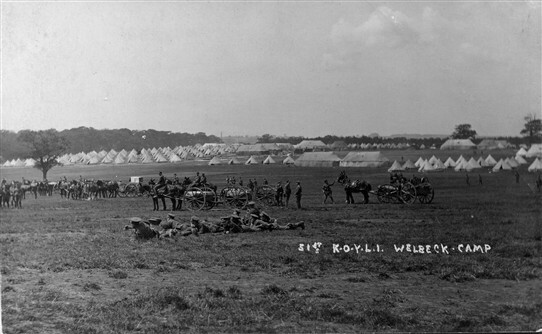 to Aug, 1918 and although it was over the ankles in mud many a time it was the happiest time of my soldering here. X shows where my tent was. The post card is not stamped or postmarked. This page was added by Pauline Marples on 13/05/2014.